Sviatoslav I of Kiev (East Slavic: Святослав, ca. 942 – 972) was the warrior prince (or konung) of Kievan Rus'. The son of Igor of Kiev and Olga, Sviatoslav is famous for his incessant campaigns in the east and south, which precipitated the collapse of two great powers of Eastern Europe–Khazaria and the First Bulgarian Empire; he also subdued the Volga Bulgars, the Alans, and numerous East Slavic tribes, and at times was allied with the Pechenegs and Magyars. His decade-long reign over Rus' was marked by rapid expansion into the Volga River valley, the Pontic steppe and the Balkans. By the end of his short life, Sviatoslav carved out for himself the largest state in Europe, eventually moving his capital from Kiev to Pereyaslavets on the Danube in 969 C.E. In contrast with his mother's conversion to Christianity, Sviatoslav remained a staunch pagan all of his life. Due to his abrupt death in combat, Sviatoslav's conquests, for the most part, were not consolidated into a functioning empire, while his failure to establish a stable succession led to civil war among his successors. Sviatoslav was the first ruler of Kievan Rus' whose name is indisputably Slavic in origin (as opposed to his predecessors, whose names most historians believe are ultimately derived from Old Norse). This name is not recorded in other medieval Slavic countries. Even in Rus', it was attested only among the members of the house of Rurik, as were the names of Sviatoslav's immediate successors: Vladimir, Yaroslav, Mstislav). Some scholars speculate that the name of Sviatoslav, composed of the Slavic roots for "holy" and "glory," was an artificial derivation combining those of his predecessors Oleg and Rurik (they mean "holy" and "glorious" in Old Norse, respectively). "Upon his expeditions he carried with him neither wagons nor kettles, and boiled no meat, but cut off small strips of horseflesh, game or beef, and ate it after roasting it on the coals. Nor did he have a tent, but he spread out a horse-blanket under him, and set his saddle under his head, and all his retinue did likewise." Sviatoslav was noted by Leo the Deacon to be of average height and build. He shaved his head and his beard but wore a bushy mustache and a braided sidelock as a sign of his nobility. He preferred to dress in white, and it was noted that his garments were much cleaner than those of his men. He wore a single large gold earring bearing a ruby and two pearls. His mother converted to Christianity at the court of Byzantine Emperor Constantine Porphyrogenitus in 945 or 957. However, Sviatoslav continued to worship Perun, Veles, Svarog and the other gods and goddesses of the Slavic pantheon. He remained a stubborn pagan for all of his life; according to the Primary Chronicle, he believed that his warriors would lose respect for him and mock him if he became a Christian. The allegiance of his warriors was of paramount importance in his conquest of an empire that stretched from the Volga to the Danube. Very little is known of Sviatoslav's family life. It is possible that Sviatoslav was not the only (and the eldest) son of his parents. The Russo-Byzantine treaty of 945 mentions a certain Predslava, Volodislav's wife, as the noblest of the Rus' women after Olga. George Vernadsky was among many historians to speculate that Volodislav was Igor's eldest son and heir who died at some point during Olga's regency. At the time of Igor's death, Sviatoslav was still "a baby," according to the Primary Chronicle and he was raised by his mother or on her instructions. Her influence, however, did not extend to his religious observance. Sviatoslav had several children, but the origin of his wives is not specified in the chronicle. By his wives, he had Yaropolk and Oleg. By Malusha, a woman of indeterminate origins, Sviatoslav had Vladimir, who would ultimately break with his father's paganism and convert Rus to Christianity. John Skylitzesreported that Vladimir had a brother named Sfengus; whether this Sfengus was a son of Sviatoslav, a son of Malusha by a prior or subsequent husband, or an unrelated Rus' nobleman is unclear. When Sviatoslav went on campaign he left his various relations as regents in the main cities of his realm: his mother Olga and later Yaropolk in Kiev, Vladimir in Novgorod, and Oleg over the Drevlians. Shortly after his accession to the throne, Sviatoslav began campaigning to expand the Rus control over the Volga valley and the Pontic steppe region. His greatest success was the conquest of Khazaria, which for centuries had been one of the strongest states of Eastern Europe. The sources are not clear about the roots of the conflict between Khazaria and Rus', so several possibilities have been suggested. The Rus' had an interest in removing the Khazar hold on the Volga trade route because the Khazars collected duties from the goods transported by the Volga. Historians have suggested that the Byzantine Empire may have incited the Rus' against the Khazars, who fell out with the Byzantines after the persecutions of the Jews in the reign of Romanus I Lecapenus. Sviatoslav began by rallying the Khazars' East Slavic vassal tribes to his cause. Those who would not join him, such as the Vyatichs, were attacked and forced to pay tribute to the Kievan Rus' rather than the Khazars. According to a legend recorded in the Primary Chronicle, Sviatoslav sent a message to the Vyatich rulers, consisting of a single phrase: "I come at you!" (Old East Slavic: "Иду на вы!") This phrase is used in modern Russian to denote an unequivocal declaration of one's intentions. Proceeding by the Oka and Volga rivers, he invaded Volga Bulgaria and exacted tribute from the local population, thus bringing under Kievan control the upper Volga River. He employed Oghuz Turks and Pecheneg mercenaries in this campaign, perhaps to counter the Khazars' and Bulgars' superior cavalry. Sviatoslav destroyed the Khazar city of Sarkel around 965, and possibly sacked (but did not occupy) the Khazar city of Kerch on the Crimea. At Sarkel he established a Rus' settlement called Belaya Vyezha ("the white tower" or "the white fortress," the East Slavic translation for "Sarkel"). He subsequently (probably in 968 or 969) destroyed the Khazar capital of Atil. A visitor to Atil wrote soon after Sviatoslav's campaign: "The Rus attacked, and no grape or raisin remained, not a leaf on a branch." The exact chronology of his Khazar campaign is uncertain and disputed; for example, Mikhail Artamonov and David Christian proposed that the sack of Sarkel came after the destruction of Atil. Although Ibn Haukal reports Sviatoslav's sack of Samandar in modern-day Dagestan, the Rus' leader did not bother to occupy the Khazar heartlands north of the Caucasus Mountains permanently. On his way back to Kiev, Sviatoslav chose to strike against the Ossetians and force them into subservience. Therefore, Khazar successor statelets continued their precarious existence in the region. The destruction of Khazar imperial power paved the way for Kievan Rus' to dominate north-south trade routes through the steppe and across the Black Sea, routes that formerly had been a major source of revenue for the Khazars. 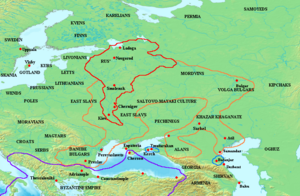 Moreover, Sviatoslav's campaigns led to increased Slavic settlement in the region of the Saltovo-Mayaki culture, greatly changing the demographics and culture of the transitional area between the forest and the steppe. Pursuit of Sviatoslav's warriors by the Byzantine army, a miniature from eleventh-century Chronicles of John Skylitzes. The annihilation of Khazaria was undertaken against the background of the Rus'-Byzantine alliance, concluded in the wake of Igor's Byzantine campaign in 944. 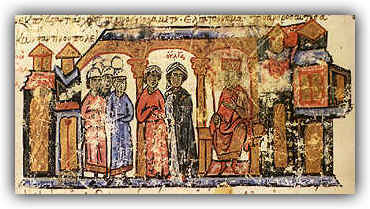 Close military ties between the Rus' and Byzantium are illustrated by the fact, reported by John Skylitzes, that a Rus' detachment accompanied Byzantine Emperor Nicephorus Phocas in his victorious naval expedition to Crete. In 967 or 968 Nicephorus sent to Sviatoslav his agent, Kalokyros, with the task of talking Svyatoslav into assisting him in the war against Bulgaria. Sviatoslav was paid 15,000 pounds of gold to defray the expense of the voyage, and set sail with an army of sixty thousand men, including thousands of Pecheneg mercenaries. Sviatoslav defeated the Bulgarian ruler Boris II of Bulgaria and proceeded to occupy the whole of northern Bulgaria. Meanwhile, the Byzantines bribed the Pechenegs to attack and besiege Kiev, where Olga stayed with Sviatoslav's son Vladimir. The siege was relieved by the druzhina of Pretich, and immediately following the Pecheneg retreat, Olga sent a reproachful letter to Sviatoslav. He promptly returned and defeated the Pechenegs, who continued to threaten Kiev. Sviatoslav refused to turn his Balkan conquests over to the Byzantines, and the parties fell out as a result. To the chagrin of his boyars and mother (who died within three days after learning about his decision), Sviatoslav decided to move his capital to Pereyaslavets in the mouth of the Danube due to the great potential of that location as a commercial hub. In the Primary Chronicle record for 969, Sviatoslav explains that it is to Pereyaslavets, the center of his lands, "all the riches flow: gold, silks, wine, and various fruits from Greece, silver and horses from Hungary and Bohemia, and from Rus furs, wax, honey, and slaves." In summer 969, Sviatoslav left Rus' again, dividing his dominion into three parts, each under a nominal rule of one of his sons. At the head of an army that included Pecheneg and Magyar auxiliary troops, he invaded Bulgaria again, devastating Thrace, capturing the city of Philippopolis, and massacring its inhabitants. Niceforus responded by fortifying the defenses of Constantinople and raising new squadrons of armored cavalry. In the midst of his preparations, Niceforus was overthrown and killed by John Tzimiskes, who thus became the new Byzantine emperor. Boris Chorikov.Sviatoslav's Council of War. John Tzimiskes first attempted to persuade Sviatoslav into leaving Bulgaria, but was unsuccessful. Challenging the Byzantine authority, Sviatoslav crossed the Danube and laid siege to Adrianople, causing panic on the streets of Constantinople in summer 970. Later that year, the Byzantines launched a counteroffensive. Occupied with suppressing a revolt of Bardas Phocas in Asia Minor, John Tzimiskes sent his commander-in-chief, Bardas Sklerus, who defeated the coalition of Rus', Pechenegs, Magyars, and Bulgarians in the Battle of Arcadiopolis. Meanwhile, John, having quelled the revolt of Bardas Phocas, came to the Balkans with a large army and promoting himself as the liberator of Bulgaria from Sviatoslav, penetrated the impracticable mountain passes and shortly thereafter captured Marcianopolis, where the Rus' were holding a number of Bulgar princes hostage. Sviatoslav retreated to Dorostol, which the Byzantine armies besieged for sixty-five days. Cut off and surrounded, Sviatoslav came to terms with John and agreed to abandon the Balkans, renounce his claims to the southern Crimea and return west of the Dnieper River. 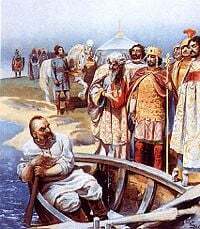 In return, the Byzantine emperor supplied the Rus' with food and safe passage home. Sviatoslav and his men set sail and landed on Berezan Island at the mouth of the Dnieper, where they made camp for the winter. Several months later, their camp was devastated by famine, so that even a horse's head could not be bought for less than a half-grivna, reports the Kievan chronicler of the Primary Chronicle. While Sviatoslav's campaign brought no tangible results for the Rus', it weakened the Bulgarian statehood and left it vulnerable to the attacks of Basil the Bulgar-Slayer four decades later. Fearing that the peace with Sviatoslav would not endure, the Byzantine emperor induced the Pecheneg khan Kurya to kill Sviatoslav before he reached Kiev. This was in line with the policy outlined by Constantine VII Porphyrogenitus in De Administrando Imperio of fomenting strife between the Rus' and the Pechenegs. 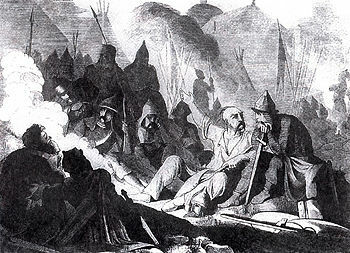 According to the Slavic chronicle, Sveneld attempted to warn Sviatoslav to avoid the Dnieper cataracts, but the prince slighted his wise advice and was ambushed and slain by the Pechenegs when he tried to cross the cataracts near Khortitsa early in 972. The Primary Chronicle reports that his skull was made into a chalice by the Pecheneg khan, Kurya. Following Sviatoslav's death, tensions between his sons grew. A war broke out between Sviatoslav's legitimate sons, Oleg and Yaropolk, in 976, at the conclusion of which Oleg was killed. In 977 Vladimir fled Novgorod to escape Oleg's fate and went to Scandinavia, where he raised an army of Varangians and returned in 980. Yaropolk was killed and Vladimir became the sole ruler of Kievan Rus'. Sviatoslav has long been a hero of Russian, Ukrainian, and Belarusian patriots due to his great military successes. His figure first attracted attention of Russian artists and poets during the Russo-Turkish War, 1768-1774, which provided obvious parallels with Sviatoslav's push towards Constaninople. Russia's southward expansion and Catherine II's imperialistic ventures in the Balkans seemed to have been legitimized by Sviatoslav's campaigns eight centuries earlier. Among the works created during the war was Yakov Knyazhnin's tragedy Olga (1772). The Russian playwright chose to introduce Sviatoslav as his protagonist, although his active participation in the events following Igor's death is out of sync with the traditional chronology. Knyazhnin's rival Nikolai Nikolev (1758-1815) also wrote a play on the subject of Sviatoslav's life. 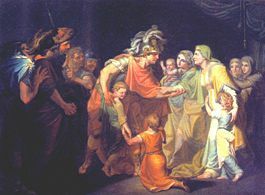 Ivan Akimov's painting Sviatoslav's Return from the Danube to Kiev (1773) explores the conflict between military honor and family attachment. It is a vivid example of Poussinesque rendering of early medieval subject matter. Светлых клич: "Иду на вы!." The cry of the bright ones: "I come at you!" He is the villain of Samuel Gordon's novel The Lost Kingdom, or the Passing of the Khazars, a fictionalized account of the destruction of Khazaria by the Rus'. The Slavic warrior figures in a more positive context in the story "Chernye Strely Vyaticha" by Vadim Viktorovich Kargalov; the story is included in his book Istoricheskie povesti (Historical Tales). In 2005, the town of Belgorod allowed the Russian sculptor Vyacheslav Klykov to place a statue dedicated to Sviatoslav's victory over the Khazars on public land. The 13-meter tall statue, which depicted a Rus' cavalryman trampling a supine Khazar bearing a Star of David, created an outcry in the Jewish community in Russia. ↑ А.Ф. Литвина, В.Б. Успенский. Выбор имени у русских князей X-XVI вв. [Choice of personal names for the Russian princes of the 10th-16th centuries.] (Moscow: Indrik, 2006. ISBN 5857593395), 43. ↑ If Olga was indeed born in 879, as the Primary Chronicle seems to imply, she should have been about 65 at the time of Svyatoslav's birth. There are clearly some problems with chronology. ↑ S. H. Cross and O.P. Sherbowitz-Wetzor. The Russian Primary Chronicle: Laurentian Text. (Cambridge, MA: Medieval Academy of America, 1953), 84. ↑ Vernadsky, 276-277. The sidelock is reminiscent of Turkic hairstyles and practices and was later mimicked by Cossacks. ↑ Based on his analysis of De Ceremoniis Alexander Nazarenko hypothesizes that Olga hoped to orchestrate a marriage between Svyatoslav and a Byzantine princess. If her proposal was peremptorily declined (as it most certainly would have been), it is hardly surprising that Sviatoslav would look at Byzantium and her Christian culture with suspicion. (Nazarenko, 302). ↑ Serge A. Zenkovsky, Medieval Russia's Epics, Chronicles, and Tales, Revised and Enlarged Edition. (NY: Meridian Books, 1974). Retrieved July 4, 2008. ↑ Whether Yaropolk and Oleg were whole or half brothers, and who their mother or mothers were, is a matter hotly debated by historians. ↑ Malusha is traditionally identified in Russian historiography as Dobrynya's sister; for other theories on her identity, see here. ↑ Synopsis Historion, John Skylitzes . in English. Retrieved July 4, 2008. ↑ David Christian. A History of Russia, Mongolia and Central Asia. (Blackwell, 1999), 345. It is disputed whether Svyatoslav invaded the land of Vyatichs that year. The only campaign against the Vyatichs explicitly mentioned in the Primary Chronicle is dated to 966. ↑ Russian Primary Chronicle for year 6472. (in Russian) The chronicler may have wished to contrast Sviatoslav's open declaration of war to stealthy tactics employed by many other early medieval conquerors. ↑ Christian, 298. The Primary Chronicle is very succinct about the whole campaign against Khazars, saying only that Sviatoslav "took their city and Belaya Vezha". 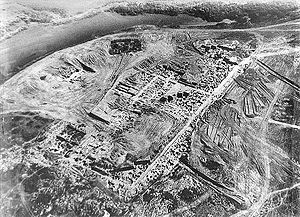 ↑ The town was an important trade center located near the portage between the Volga and Don Rivers. By the early twelfth century, however, it had been destroyed by the Kipchaks. ↑ Mikhail Artamonov. Istoriya Khazar. (Leningrad: 1962), 428 (in Russian); Christian, 298. ↑ The campaign against Ossetians is attested in the Primary Chronicle. The Novgorod First Chronicle specifies that Sviatoslav resettled the Ossetians near Kiev, but Sakharov finds this claim dubitable. ↑ The Mandgelis Document refers to a Khazar potentate in the Taman Peninsula around 985, long after Sviatoslav's death. Kedrenos reported that the Byzantines and Rus' collaborated in the conquest of a Khazar kingdom in the Crimea in 1016 and still later, Ibn al-Athir reported an unsuccessful attack by al-Fadl ibn Muhammad against the Khazars in the Caucasus in 1030. For more information on these and other references, see Khazars#Late references to the Khazars. ↑ Mikhail Tikhomirov and Vladimir Pashuto, among others, assume that the Emperor was interested primarily in diverting Sviatoslav's attention from Chersonesos, a Byzantine possession in the Crimea. 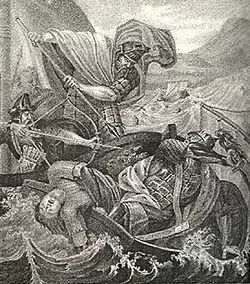 Indeed, Leo the Deacon three times mentions that Svyatoslav and his father Igor controlled Cimmerian Bosporus. If so, a conflict of interests in the Crimea was inevitable. The Suzdal Chronicle, though a rather late source, also mentions Sviatoslav's war against Chersonesos. In the peace treaty of 971, Sviatoslav promised not to wage wars against either Constantinople or Chersonesos. Byzantine sources also report that Kalokyros attempted to persuade Sviatoslav to support Kalokyros in a coup against the reigning Byzantine emperor. As a remuneration for his help, Sviatoslav was supposed to retain a permanent hold on Bulgaria. Modern historians, however, assign little historical importance to this story. (Thomas Downing Kendrick. A History of the Vikings. (original 1930; reprint Kessinger Pubs, 2007. ISBN 1432517767157)). ↑ All figures in this article, including the numbers of Svyatoslav's troops, are based on the reports of Byzantine sources, which may differ from those of the Slavonic chronicles. Greek sources report Khazars and "Turks" in Sviatoslav's army as well as Pechenegs. As used in such Byzantine writings as Constantine Porphyrogenitus' De Administrando Imperio, "Turks" refers to Magyars. The Rus'-Magyar alliance resulted in the Hungarian expedition against the second largest city of the empire, Thessalonika, in 968. ↑ Grekov 445–446. The Byzantine sources report the enemy casualties to be as high as 20,000, the figure modern historians find to be highly improbable. ↑ The use of a defeated enemy's skull as a drinking vessel is reported by numerous authors through history among various steppe peoples, such as the Scythians. Kurya likely intended this as a compliment to Sviatoslav; sources report that Kurya and his wife drank from the skull and prayed for a son as brave as the deceased Rus' warlord. Christian, 344; Pletneva, 19; Cross and Sherbowitz-Wetzor, 90. ↑ Vadim Viktorovich Kargalov. "Chernye Strely Vyaticha" Istoricheskie povesti (Historical Tales) (Moscow: Det. lit., 1989). ↑ Galina Kozhevnikova, "Radical nationalism and efforts to oppose it in Russia in 2005" English translation by Irina Savelieva. Retrieved July 4, 2008. Barthold, W.. "Khazar." Encyclopaedia of Islam (Brill Online). Retrieved July 4, 2008. (login required) Eds. : P. Bearman, Th. Bianquis, C.E. Bosworth, E. van Donzel and W.P. Heinrichs. Brill, 1996. Cooke, Raymond. Velimir Khlebnikov: A Critical Study. (Cambridge Studies in Russian Literature) Cambridge University Press,  2006 ISBN 0521031737. Gordon, Samuel. The Lost Kingdom, or the Passing of the Khazars. London: Shapiro, Vallentine, 1926. (A novel about the destruction of Khazaria by the Rus'). Grekov, Boris. Kiev Rus, tr. Y. Sdobnikov; ed. Denis Ogden. Moscow: Foreign Languages Publishing House, 1959. Manteuffel Th. "Les tentatives d'entrainement de la Russie de Kiev dans la sphere d'influence latin." Acta Poloniae Historica. Warsaw, t. 22, 1970. Chlenov, A.M. (А.М. Членов.) "K Voprosu ob Imeni Sviatoslava." Lichnye Imena v proshlom, Nastoyaschem i Buduschem Antroponomiki ("К вопросу об имени Святослава." Личные имена в прошлом, настоящем и будущем: проблемы антропонимики) (Moscow, 1970). Kargalov, Vadim Viktorovich. "Chernye Strely Vyaticha" Istoricheskie povesti (Historical Tales) Moscow: Det. lit., 1989. History of "Sviatoslav I of Kiev"
This page was last modified on 4 July 2008, at 20:10.